Whether you’re running a small business or a large organization, seeing your results in an easy to understand report is essential. JotForm not only gives you the ability to collect data from people, it also allows you to view it in a variety of ways. These reports go handy when you want to see the latest updates from your users in one place. This is just a brief overview of what each report does. For an in-depth instruction on how to set them up and which options are available for each, refer to the detailed guides above. Some reports allow password protection to ensure that your Submission Data is safe and will only be shared with your peers. To create a report, navigate to your MY FORMS page > select a form > click the REPORTS ▼ menu > then ADD NEW REPORT. This will bring up a list of all the possible report options for that form. You may be familiar with the option to download your data to an Excel file through the Submissions Page. Doing that will give you all the submission results. So, what's the difference? The benefit of using this Excel Report is it allows you to include/exclude the columns you need. The generated Excel Report can be opened with any compatible application including Google Spreadsheets, Microsoft Office, Libre Calc and any other Excel alternative. These are for those who might use Excel, or may prefer to load their information into a separate or custom built application. Using files in CSV format is an extremely simple and traditional way to transfer data between two end points. This is similar to the grid you see at the bottom of the Submissions Page. You can hide or show columns as you please which allows you to create a more flexible custom report. Another great feature is its search functionality. 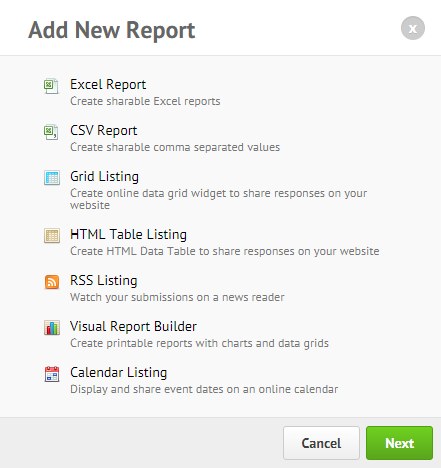 The HTML Table Listing Report will apply to users who want to share their submission data and present it as a table. It will allow you to quickly view all the form submissions online. You can sort them by columns by clicking the column name. It also displays thumbnails of photos that opens with a larger preview when clicked. If you're familiar with RSS feeds, this should work well with your favorite reader. On top of that, you can get notifications of new submissions right on your desktop or your app, just like how you get notifications about your favorite feed. Here’s how an RSS feed would look like within a reader, in this case, within Feedly. This report is a staple for many, as it’s the most customizable and offers a variety of visual options. 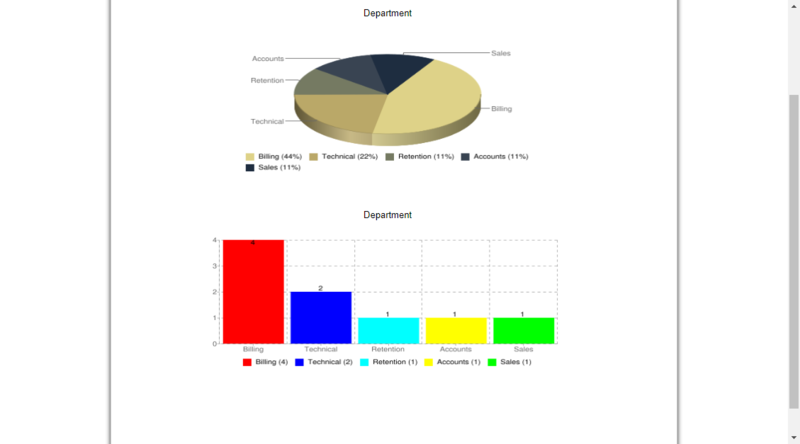 It allows you to take the parts of your data and display them in charts and graphs, as well as including the grid format if desired. This is what monthly reports are made of along with quarterly and annual reports. You can quickly sort through them by matching any or all filters and the results are shown immediately. This is a great way to see what data was received and when. Notice the dots on the dates below? Clicking them will open up the submissions for that particular date. If you click it again, it will bring up the full results of that submission. can customize the number of submissions I would like to view as a Report? No puedo realizar reportes. queda trabajando el sistema, no avanza. No se puede obtener el reporte cuando selecciono la opción de realizar el mismo. Would I be able to use the submissions report with an attachment and be able to send it to other to access a portion? For example, send the A's to person A outside of the organization. Send the B's to person B, whom is also outside of the organization. 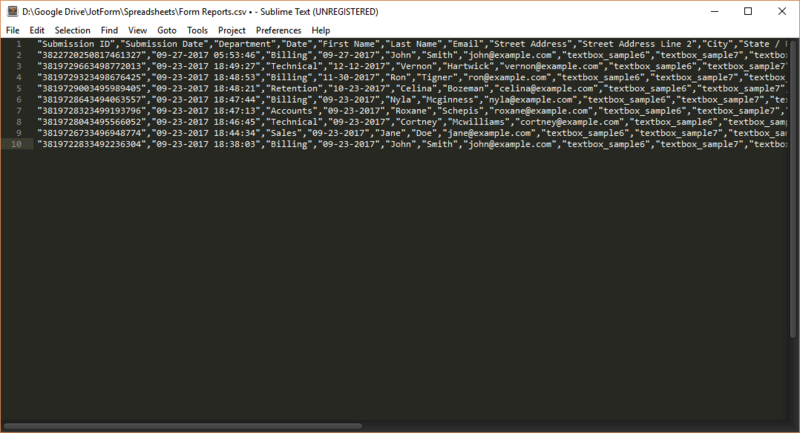 The people outside of the organization will be able to open the data with the JotForm or see it as a submission report? Is there any way to make the submission information automatically feed to a report so I don't have to manually keep downloading it to get the most updated report? Do you have to be a paid user to make reports? Hi, I work for a charity that has over 30 different 'branches'. All enquiries go through the same form, but submitters choose their branch from a drop down. Is it possible to customise the report so that only those who, for example, have chosen "London Branch" are visible in a spreadsheet - or even have a select response correspond to an individual email? It's very tedious having to open the whole report and copy and paste select responses into a separate spreadsheet and then email that spreadsheet on to the branch leader every time there is a new enquiry.